Hamtramck residents will have many opportunities to fire Gov. Rick Snyder if two men long associated with the city have their way. Both Hamtramck Police Sergeant Andy Mileski and Hamtramck resident Chris Cornwell, a longtime community activist and former city councilperson, will be circulating petitions at various locations in the city from now until Aug. 5, when signed petitions are returned to the state. Michigan Citizens United (MCU), a bipartisan political action committee formed in April to recall the governor, has become the clearinghouse of the statewide recall effort. To achieve its goal, MCU needs to collect 807,000 signatures — 25 percent of the total vote in the last state election. Estimating that 20 percent of the signatures will be proven ineligible, the political organization is aiming to collect about 1.1 million signatures. The state allowed petitioners to begin collecting signatures on May 21, but MCU has not released signature tallies since the campaign began for fear of inaccuracies. 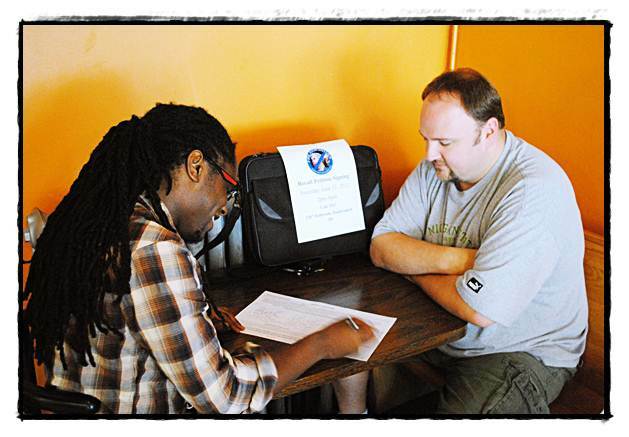 Cornwell, who works for the Hamtramck Housing Commission, said he collected about 30 signatures from Hamtramck residents at his first signing event, but said that he was surprised at the amount on nonresidents who wanted to sign the petition or get involved in the campaign. Mileski is holding his first signing event from 11 a.m. to 2 p.m. on Saturday, June 25, in the Hamtramck Town Center parking lot at Jos. Campau and Holbrook (near Glory Market). Like many citizens across the state, Mileski and Cornwell are not reacting against one facet of the governor’s actions, they are protesting Snyder’s agenda as a whole, but Mileski acknowledged that recalling the governor would be a long shot. Among other things, the Act allows the state to appoint emergency financial managers for both municipalities and school districts. Cornwell and Mileski, a union member, are also worried about Snyder’s attempts to inhibit and curtail collective bargaining rights and his plans to balance the state budget through tax cuts for corporations and budget cuts. Mileski said Snyder’s agenda, which calls for service employees like police officers to do more with less, will not lead to improvement. Cornwell, who was able to examine closely some of the adverse effects of an emergency financial manager while he served as a Hamtramck councilperson, said that the time to recall Snyder is now, and that people should not take a wait-and-see attitude.